Federal managers often are reluctant to talk about the security products they use, but an FBI agent has found one that he wants to see used more often to locate lost or stolen notebook PCs. 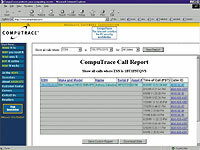 The CompuTrace service relies on scheduled check-ins by its software agent to keep track of mobile computers it covers. Managers can check their machines on a Web site. 'Being in Washington and knowing the number of thefts we have here from agencies, I wish they all' would use the CompuTrace software service, said Marc Dinardo, a special agent with the FBI's interstate theft division. Loaded on a notebook, the CompuTrace software automatically dials up or connects with a server at Absolute Software Corp. in Vancouver, British Columbia. The company tracks where the computer called from and, if it is reported stolen, helps police recover it. The FBI has used the product. 'We had a situation where we were selling a large number of computers that were purported to be stolen,' Dinardo said. For financial and evidentiary reasons the bureau did not want them to disappear, so all were loaded with CompuTrace. 'We ended up getting all but five or so back' out of several dozen computers, he said. The federal government is a big market for CompuTrace, said David Legg, marketing analyst for Absolute Software. For government users, the service costs $39 per computer for one year, $69 for two years and $94 for three years. The company has 440 customers. One government case that was publicized involved the theft two years ago of three notebooks from the General Services Administration in Atlanta. The Federal Protective Service recovered them with the help of information from Absolute Software. 'We started using [the service] about three years ago,' said Karen Greenhaugh, systems chief for Region 4 of the GSA's Public Building Service. At the time, CompuTrace was the only product of its kind. GSA bought 150 CompuTrace licenses for less than $3,000 and pays about $3,000 in annual service fees. CompuTrace has three components: a tracking agent, a monitoring center and a recovery service. The tracking agent requires 8K of RAM and runs on any 486 or faster PC with a Hayes-compatible modem and a Microsoft Windows operating system. At regular intervals it dials the monitoring center's toll-free 800 number. A recently released IP version also can use any Internet connection to reach the monitoring center server. The monitoring center identifies the calling software by an electronic serial number and records the phone number or IP address with a time and date stamp. The monitoring center also sends back instructions about when to call again. Managers can check the status of all their protected machines through a password-protected Web site that posts call-in records. When a registered user reports a computer missing, the data trail can help trace its whereabouts. Law enforcement agencies can use the information to obtain search warrants. Absolute Software claims that the CompuTrace agent is undetectable on the hard drive and that calls to the monitoring system are invisible to the user. Wiping or reformatting the hard drive or reinstalling the operating system does not remove the tracking agent, which can only be deleted via the registered installation disk accompanied by a password. 'There are not too many things you can steal that are worth $3,000 that you can fit under your coat,' Dinardo said. The FBI, he said, recently shut down a Washington-area theft ring whose members would walk into high-tech offices shortly before closing time and walk out with notebooks. 'That was their job, day in, day out,' he said. Even with a tracking tool, tracing a computer can be tough. 'Sometimes [thieves] cannibalize them' and sell the parts, Dinardo said. 'They aren't going to make as much money, unlike a car,' but selling the parts can be safer. Even taking a computer apart does not ensure it will not be found, however. With the help of CompuTrace, the FBI has found a number of hard drives that had been 'parted out' and incorporated in other machines, Dinardo said. When the unsuspecting new users plugged them in, the software agents, still resident on the hard drives, phoned home to the monitoring center.